Finally let loose from the restraints of the “additional music” credit, HANS ZIMMER protégé LORNE BALFE has been unleashed on IRONCLAD, a film reminiscent of many a classic REMOTE CONTROL PRODUCTIONS (RCP) film score. Set in a 13th Century England, IRONCLAD follows the struggle of a Templar Knight and his group of warriors in their attempt to preserve what liberty and freedom remained during the reign of King John. Such a setting comes with many a preconception in regards to music, and IRONCLAD certainly lives up to the anticipated brooding atmosphere and visceral action music. It is easy to forget that it was only in 2009 that LORNE BALFE was truly announced to the world of scoring for visual entertainment. CALL OF DUTY: MODERN WARFARE 2 was the first real glimpse of BALFE’S talents having previously played the part of the additional music provider. Clearly such a role within RCP scores has prepared him well as his most recent projects, including IRONCLAD show that he has matured into a composer fully capable of standing alone while remaining one of great potential. That said, IRONCLAD is not a score with excess amounts of innovation, but rather one that generally relies on the convention of genre with BALFE adding his own spin on proceedings. 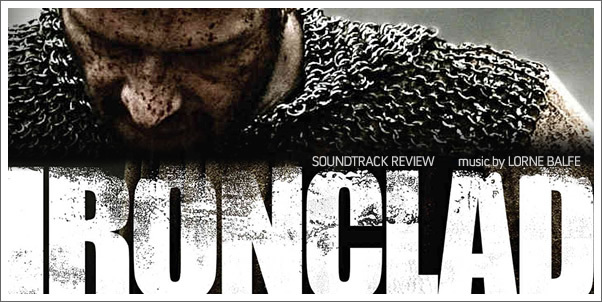 After an initial run-through, IRONCLAD can be described as an amalgamation of ZIMMER’S GLADIATOR, KING ARTHUR, HARRY GREGSON-WILLIAMS’ KINGDOM OF HEAVEN somewhat surprisingly, ZIMMER and BALFE’S MODERN WARFARE 2. Such similarities are immediately apparent in “The Magna Carta” (1), as the typical but equally effective crashing percussion and brooding bass strings and choir set a dark and oppressive atmosphere. The omnipresent plucking and string ostinato maintain a constant driving undercurrent as the strained vocal lead harks back to many a historical epic. Despite any moments of reminiscing, the piece does a fine job of crafting a suitably gloomy horizon for the rest of the score to reach for.